Down to 59 dBA: If you are looking for a unit that does not interrupt your day-to-day life, this iQ Drive unit is the one to choose. This unit operates at noise levels down to 59 dBA. Inverter-Driven, Rotary Compressor: Energy-efficient heating and air conditioning systems employ some of the latest and greatest technology. This air conditioner uses an inverter-driven, rotary compressor that modulates between 40% and 118% of capacity. This makes it ultra efficient. It reaches up to 25.5 SEER! Whole-Home Dehumidification Assistance: iQ Drive systems are not only efficient, but provide premium home comfort as well. Because these units run longer at lower levels, they provide additional dehumidification capabilities. iQ Drive Compatible Controller: The comfort of your indoor environment is important. That is why this iQ Drive unit uses the iQ Drive controller. With this quality thermostat, you can enjoy a programmable comfort schedule, maintenance reminders and troubleshooting diagnostics. Superior Efficiency: The best systems qualify for the ecoLogic® green seal. These units are not only energy efficient, but they include additional home comfort features. ENERGY STAR cooling: This air conditioner is exceptionally efficient. It surpasses ENERGY STAR's standards for efficient equipment in certain sizes and matches. Checks at Every Step: We make sure that each air conditioner meets our high quality standards. That is why this model is checked 144 times before leaving the factory. If you are looking for our leading air conditioning system, go with the FS4BI series of iQ Drive air conditioners. This air conditioning model uses an inverter-driven rotary compressor to reach up to 25.5 SEER! That can translate to significant savings on your cooling bills. 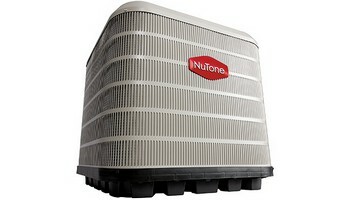 Ask your NuTone contractor about an iQ Drive air conditioner. Voted a top choice by a leading consumer magazine.NuTone HVAC products are smart solutions that fit your life, style and home - and our warranty reflects our confidence in the resulting quality. NuTone heating and cooling products offer one of the longest warranties in the business - 10 years on all parts. Product registration is required for maximum warranty coverage. Warranty applies to equipment manufactured after January 1, 2015.10-Year Parts Warranty: 10 years on all parts when product is registered. See warranty details for more information. Exceptional Operation: This heat pump not only has heating and cooling capabilities all-in-one, but it includes an inverter-driven rotary compressor. This unit can modulate between 40% and 118% capacity – saving you energy and money on utility bills. Operates Quietly: This iQ Drive heat pump addresses all of your heating and cooling needs and operates at exceptionally low sound levels – down to 59 dBA. Added Humidity Regulation: Take the edge off of the humidity in your home with an iQ Drive system. These units run at low levels for a longer period of time, removing more humidity from the air. Programmable Comfort Schedule: The iQ Drive line doesn’t miss anything when it comes to premium performance. This unit utilizes the iQ Drive controller, a programmable thermostat that provides maintenance reminders and troubleshooting diagnostics. Peak Performance and Efficiency: There is an easy way to find the best equipment – just look for the ecoLogic® green seal. This unit qualifies for the efficiency seal by exceeding ENERGY STAR requirements (in certain sizes and matches) and including additional home comfort features. Built for Quality: Want the best quality possible? Turn to NuTone. We check all heat pumps 144 times before they leave the factory. The FT4BI series of iQ Drive heat pumps offers ultra-high efficiency and premium home comfort. This premium heat pump, when properly matched with one of our NuTone indoor systems, offers award-winning 20 SEER, 10 HSPF cooling and heating efficiency. Ask your contractor if this is the right high-efficiency heat pump for your home.